By Frederic Damrau, M. D.
LIFE-SAVING by surgery, the most dramatic phase of modern medicine, now includes the removal of whole organs from the human body. This is one of the most recent daring advances in the technique of the operating room. 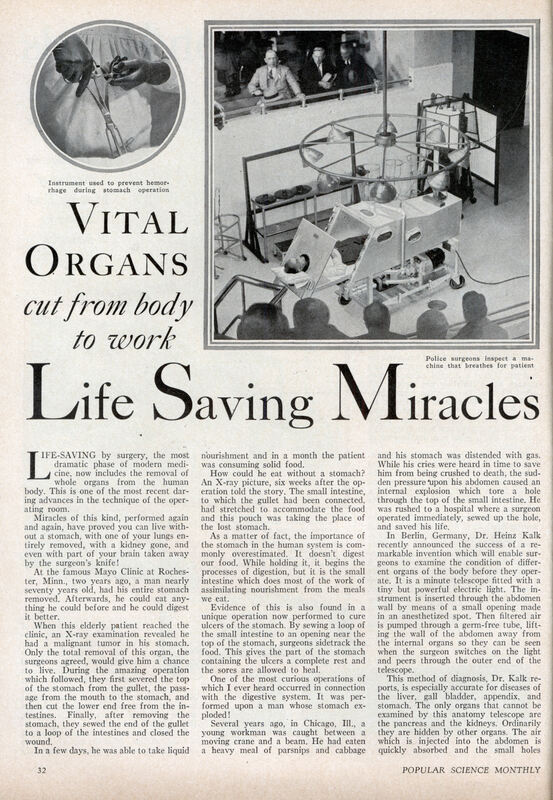 Miracles of this kind, performed again and again, have proved you can live without a stomach, with one of your lungs entirely removed, with a kidney gone, and even with part of your brain taken away by the surgeon’s knife! At the famous Mayo Clinic at Rochester, Minn., two years ago, a man nearly seventy years old, had his entire stomach removed. Afterwards, he could eat anything he could before and he could digest it better. When this elderly patient reached the clinic, an X-ray examination revealed he had a malignant tumor in his stomach. Only the total removal of this organ, the surgeons agreed, would give him a chance to live. During the amazing operation which followed, they first severed the top of the stomach from the gullet, the passage from the mouth to the stomach, and then cut the lower end free from the intestines. Finally, after removing the stomach, they sewed the end of the gullet to a loop of the intestines and closed the wound. In a few days, he was able to take liquid nourishment and in a month the patient was consuming solid food. How could he eat without a stomach? An X-ray picture, six weeks after the operation told the story. The small intestine, to which the gullet had been connected, had stretched to accommodate the food and this pouch was taking the place of the lost stomach. As a matter of fact, the importance of the stomach in the human system is commonly overestimated. It doesn’t digest our food. While holding it, it begins the processes of digestion, but it is the small intestine which does most of the work of assimilating nourishment from the meals we eat. Evidence of this is also found in a unique operation now performed to cure ulcers of the stomach. By sewing a loop of the small intestine to an opening near the top of the stomach, surgeons sidetrack the food. This gives the part of the stomach containing the ulcers a complete rest and the sores are allowed to heal. One of the most curious operations of which I ever heard occurred in connection with the digestive system. It was performed upon a man whose stomach exploded ! Several years ago, in Chicago, Ill., a young workman was caught between a moving crane and a beam. He had eaten a heavy meal of parsnips and cabbage and his stomach was distended with gas. While his cries were heard in time to save him from being crushed to death, the sudden pressure upon his abdomen caused an internal explosion which tore a hole through the top of the small intestine. He was rushed to a hospital where a surgeon operated immediately, sewed up the hole, and saved his life. In Berlin, Germany, Dr. Heinz Kalk recently announced the success of a remarkable invention which will enable surgeons to examine the condition of different organs of the body before they operate. 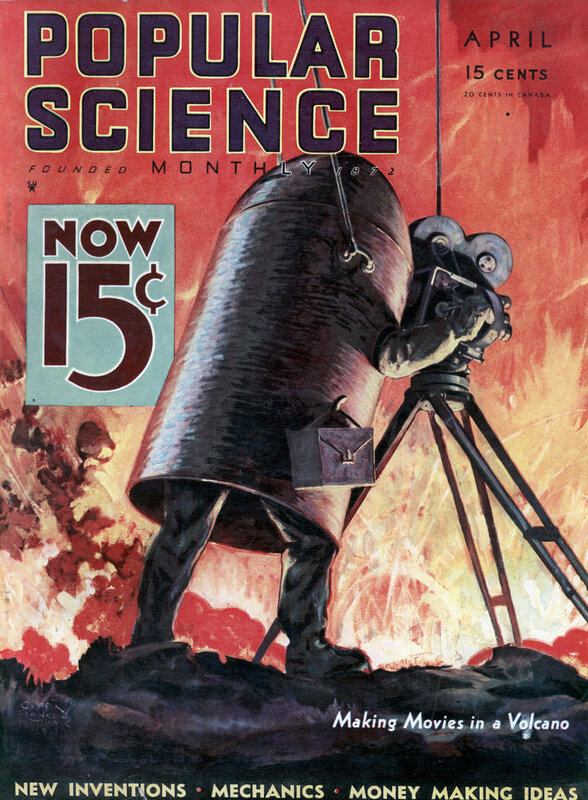 It is a minute telescope fitted with a tiny but powerful electric light. The instrument is inserted through the abdomen wall by means of a small opening made in an anesthetized spot. Then filtered air is pumped through a germ-free tube, lifting the wall of the abdomen away from the internal organs so they can be seen when the surgeon switches on the light and peers through the outer end of the telescope. This method of diagnosis, Dr. Kalk reports, is especially accurate for diseases of the liver, gall bladder, appendix, and stomach. The only organs that cannot be examined by this anatomy telescope are the pancreas and the kidneys. Ordinarily they are hidden by other organs. The air which is injected into the abdomen is quickly absorbed and the small holes necessary for inserting the telescope and the air tube are said to give no trouble. When accidents paralyze or destroy whole organs or parts of the body, striking emergency operations are sometimes necessary to save the life of a patient. I remember one dramatic case which saved an orderly in a hospital from starving to death. One sweltering summer evening, he picked up what he thought was a glass of water and gulped it down. It was a disinfecting solution of lye. The powerful alkali seared the tissues of his throat so badly that the gullet closed in a tight scar. He could not swallow. Somehow, food had to be got into his stomach. In the operating room, I watched the surgeon make a small opening through the wall of the abdomen into the stomach. Then he inserted a tube and sewed it permanently in place. Through this tube, the man now feeds himself. Although no food ever enters his mouth, he is in good health and is able to continue his work and earn a living. Not long ago, a business man in Charlotte, N. C, fell victim to a similar accident. For six months, he obtained nourishment through a rubber tube inserted in his stomach. Then the tiny opening down his practically-closed throat was gradually widened by a unique operation which a surgeon had him perform each morning. He swallowed a small metal ball and pulled it up again to stretch the injured membranes. The size of the ball gradually has been increased until the opening is now sufficiently large for him to eat in the normal way. Even more sensational than either one of these feats was a daring and original operation performed by Dr. Carl Eggers of New York City. One of his patients had a tumor completely obstructing the lower end of his gullet. Dr. Eggers made an incision in the stomach wall so the man could be fed temporarily through a funnel and rubber tube. Then, he drilled a hole through the upper part of the breast bone and. by a second operation through the back, cut the gullet free above the obstruction and attached it to the hole. To complete this miracle of human carpentry, he connected the end of the gullet, at the hole in the breast bone, with the opening in the stomach, using a piece of rubber tubing a foot long. This tube passes outside the patient’s body in front of the chest. But it is entirely hidden by his clothing so his appearance is the same as that of other men. He chews, swallows, enjoys his food, and can eat anything. Since being fitted with his marvelous rubber food-channel, he has regained his strength and has returned to work. In England, the famous British surgeon, Sir Arbuthnot Lane, has removed half of the five-and-a-half-foot colon, or large intestine, in an operation for aggravated cases of constipation. Some of his colleagues refer to him as the surgeon who changes the colon into the semicolon. An ingenious device which suggests a snap cuff-link is now frequently used by surgeons to aid in difficult stomach and intestine operations. It is known as a “Murphy button.” It saves time and increases the efficiency of the surgeon in joining different tissues. Two button-like plates of metal, each fitted with a hollow stem, are so arranged that when one stem is inserted inside the other and the buttons are pressed together, they snap permanently in place. I recall one operation in which a Murphy button played an important part. We had to remove fully three-fourths of a patient’s stomach, sew the remainder together into a small bag, using fine catgut stitches, and then open a new channel from the stomach into the intestines. the stomach and the slit in the intestine snugly in place. Quickly, the tissues were sewed together over the button, providing a new channel for the food. In a few weeks, these tissues had grown solidly together and the Murphy button, no longer needed, was passed off by the body. Sometimes an organ in the body turns traitor and has to be removed. One such perverse part of the human anatomy is the spleen, regarded by the ancients as the seat of bad temper. Hugging the lower ribs, on the left side of the abdomen, it acts as a storehouse for broken-down red blood-corpuscles. The life of a blood cell is about twenty days. When it is worn out, the remains act as a poison to the body unless they are removed. The liver turns them into bile, which is poured from the gall bladder into the small intestine where it acts as an antiseptic and also aids in digesting fats. The spleen takes care of the surplus dead cells which the liver cannot turn into bile. Occasionally, in some mysterious way, it runs amuck, killing red corpuscles and destroying the power of the blood to clot. As a consequence, the afflicted person may bleed to death from a simple scratch. Last year, a man fifty years old was brought to St. Luke’s Hospital, in New York City. He was white as a ghost from loss of blood. Transfusions failed to stop the internal hemorrhage which threatened his life. Blood in his body simply would not coagulate. In the operating room, Dr. Edward J. Donovan, the surgeon in charge, opened the abdomen an inch or so below the lower left rib. He could see the spleen distended to twice its normal size. It was the trouble-maker. Prying the organ loose from its attachments, he clamped the arteries and veins leading to it and then cut it free, afterwards tying the severed arteries and sewing together the abdominal wall in layers. Six hours after the operation, tests proved that the man’s blood was again clotting satisfactorily. By removing a whole organ from his body, his life had been saved. In another case, Dr. Donovan operated upon a baby, ten months old, removing an enormous spleen which weighed one-, fourteenth as much as the child himself. It has been found that when the spleen is removed its functions are taken over by the small lymph glands distributed throughout the body. An axiom of surgery used to be: Leave the tube carrying bile from the liver to the intestines alone or the patient will die. In defiance of this axiom, Dr. Golder L. McWhorter, of the Presbyterian Hospital, in Chicago, performed a sensational operation that saved a woman’s life. He found that her bile tube was diseased and completely obstructed. She was already the color of bronze from prolonged jaundice. Her chances of recovery appeared slim. A less courageous surgeon would have declared the case hopeless and death would have been inevitable. But, McWhorter played a long shot and won. He cut out both gall bladder and bile tube and then created a new passage for the bile by hitching the thin duct coming from the liver, which ordinarily carries the bile to the gall bladder, to the intestines. This artificial passage functioned perfectly. Eight years later, when the surgeon saw the woman again, she was in excellent health. Another axiom of the medical books concerns the skin, which, with its many functions, is actually an organ of the body. “Lose a third of your skin,” it declared, “and you lose your life.” Recently, this belief was upset by the strange case of Luby J. Doty, of Memphis, Tenn.
Doty started on a fishing trip with two companions. The car in which they were riding overturned, exploded, burned his companions to death and seared more than a third of his skin from his back and legs. To keep the raw flesh from getting chilled, doctors placed him in a sheet-iron oven kept at a constant temperature of 103 degrees F. by four large electric bulbs. For 412 days, Doty lay face downward in this metal heater. His arms and head projected so he could read and play cards to amuse himself. At the end of his long imprisonment in the oven, his seared flesh had cleared up, new skin was grafted on the burned areas and his remarkable recovery was complete. Not infrequently, nowadays, when a kidney becomes diseased it is removed. referred to in “the next article of this series, I have seen as much as a handful of brain matter removed by the surgeon from within the skull of the patient who made a complete recovery. Similarly, complete lungs are now removed on the operating table to save lives in desperate cases. The fact that a person can walk the streets well and happy with only one lung is made use of by surgeons in treating certain cases of advanced tuberculosis. I remember one instance which occurred under unusual circumstances. A star athlete had just crossed the finish line, a winner in the 100-yard dash, when he fainted and later began spitting blood. To our astonishment, an X-ray of his chest showed his left lung was riddled with patches of tuberculosis. The right lung was normal. We decided to compress the left lung completely, leaving the right one to supply the oxygen. Below and to the left of the heart, between the seventh and eighth ribs, we inserted a sharp, hollow needle through which nitrogen gas was pumped from a pressure tank into the pleural sac, the membranous bag surrounding the lung. As the pressure increased, the lung was squeezed smaller and smaller until it occupied a space no larger than your fist. THEN the patient was sent to the Adirondack Mountains for rest, open air, and sunshine treatment. Every two weeks, more nitrogen gas was injected into his pleural sac to make up for what had leaked out. This treatment gave the left lung what it needed most of allâ€”rest and freedom from the strain of breathing. At the end of six months, the patches of tuberculosis had healed and nature had surrounded them with a wall of lime deposits to protect the healthy portions of the lung from infection. Gradually, we let the nitrogen gas leak out of the pleural sac, allowing the compressed lung to expand and occupy its natural position in the chest. Today, the young man has two healthy lungs and is earning his living in an active profession. One of the most simple, and at the same time marvelous, organs of the body is the larynx, or voice-box. The Adam’s apple is the most conspicuous external part. Just a little variation in the quality of two small ligaments inside the larynx, the vocal cords, accounts for the difference between the voice of a Caruso and that of a street-hawker whose voice has been roughed by abuse. You can live without a larynx, but you cannot speak. I remember, several years ago, Dr. George W. Crile showing a group of interested surgeons at the Cleveland, O., clinic, a man seventy-two years old whose life he had saved twenty-nine years before by taking out the entire larynx because of cancer. For nearly thirty years, the man had been breathing comfortably through a hole in his neck just above the breast bone. NOT long ago I met a woman whose whole voice-box had been removed and yet who told me about it! She had been equipped with an artificial larynx, a rubber tube containing a vibrating musical reed. One end of the tube was connected with the windpipe through a hole in the lower part of the neck. The other end was passed through the nose to the back of the throat. By means of this strange voice-box, the woman could talk so clearly there was no difficulty in understanding her. During recent years, the daring of the surgeon, in attempting to save cases that seem hopeless, has developed spectacular new methods in the operating room. Removing whole organs from the body, performing feats which were considered fatal only a few years ago, the surgeon of today wins brilliant new victories as a saver of human life.